An individually wrapped, great tasting, moist Down Home Candy Cookie made with candy-coated chocolate. 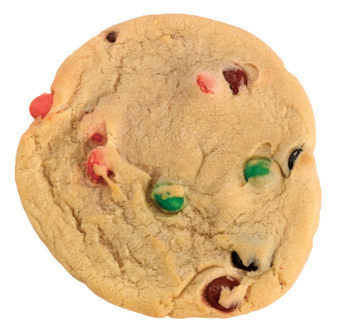 This sugar cookie is loaded with candy-coated chocolate that explodes from each cookie. It’s an award-winning recipe everyone loves. Our Super Sized Down Home Cookies are soft and chewy, loaded with chunks and chunks of the finest ingredients and a new butter formula, providing an amazingly rich down home flavor. They look homemade with their hand-wrapped look and feel. Zero trans fats, and a full 21-day shelf life. They’re available in 4 great flavors: Chocolatey Chunk, Oatmeal Raisin, Peanut Butter Chocolate Chip and Chocolatey Candy.